Is your staff prepared to respond to a stroke? Education about symptoms should target office staff with patient contact, as well as patients and relatives of those at risk. Diana Fite, MD, was driving home after her shift in the emergency department when the right side of her body went weak and her car started to swerve. Kicking her right leg off the gas pedal and using her left hand to steer, the 53-year-old quickly pulled over to the side of the road. In disbelief, she looked in the visor mirror and tested her ability to smile—and saw only one half of her mouth move. That's when she finally accepted she was having a stroke. New research suggests that it is not only patients and bystanders who are unaware or dismissive of stroke symptoms. A troubling study presented at the American Stroke Association's annual International Stroke Conference in February found that nearly a third of receptionists in primary care offices would, if talking to patients who reported classic stroke symptoms, direct them to come in for a visit later in the day, rather than telling them to call 911. There was a spot of hope in the study results, however. When the researchers sought advice for hypothetical heart attack symptoms, the receptionists advised calling 911 100% of the time. Everyone from patients to medical office staff can benefit from a concerted effort to increase public knowledge about stroke, experts said. The “Give Me 5” stroke awareness campaign, announced in late March, aims to do just that. Sponsored by the American Academy of Neurology (AAN), the American College of Emergency Physicians (ACEP), and the American Stroke Association (ASA), the campaign endorses a quick check of major stroke symptoms with five words: Walk (impaired balance), Talk (slurred speech or facial droop), Reach (weakness or numbness), See (impaired vision) and Feel (severe headache). 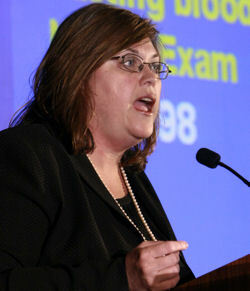 It also seeks to combine the best aspects of pre-existing stroke education efforts. The “Suddens” campaign, which gives a list of symptoms starting with the word “Sudden,” is inclusive but not catchy. And the “FAST” (Face, Arm, Speech, Time) campaign is memorable, but omits important symptoms like headache and vision problems. “A national online survey of 1,000 people found that unaided recall of the five warning signs with ‘Give Me 5’ was twice as high as it was with the ‘Suddens,’” said Wendy Segrest, ASA's director of operations. The hope is that the comprehensive “Give Me 5” will be catchy enough to be remembered, and that it will become the gold standard for public and patient education, both in doctors' offices and beyond, she added. The campaign's new Web site has resources that physicians can download to educate patients and their own staff, like brochures and posters. Campaign organizers deliberately chose women—actress Morgan Fairchild and Dr. Fite—as spokespeople for the campaign, since women account for nearly 70% of deaths from stroke and are typically in charge of a family's health matters. In addition, research released at February's stroke conference showed the rate of stroke among middle-aged women tripled from 1988-1994 compared to 1999-2004. Getting to the hospital within three hours of a stroke is critical so that patients can be evaluated in time to receive tissue plasminogen activator (tPA) when appropriate. Yet many in the general public are unaware of how critical the time element is, Dr. Fite noted. Primary care offices are a crucial area for stroke education, as they are often a patient's first stop after stroke symptoms occur. An article in the January 2003 Stroke found that physician offices were a more common route of referral to acute stroke units than either ambulance staff or ED doctors. And a study presented at the 2008 International Stroke conference found that, in 22% of cases, a patient or bystander's first response to stroke symptoms was to call a doctor, not an ambulance. 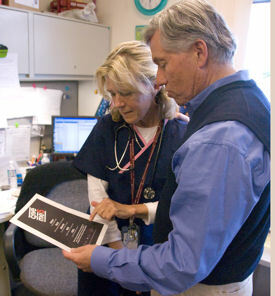 Ted Epperly, MD, right, CEO and program director, Family Medicine Residency of Idaho, discusses the Give Me Five stroke recognition program with nurse manager Signe Blackman, RN. The study also found that 45% of doctors' offices advised patients to call an ambulance when they reported stroke symptoms, while 36% advised them to come in for a visit. Interestingly, doctors' offices were far more likely to advise calling an ambulance when someone called on the patient's behalf than when the patient called for himself or herself. Ted Epperly, MD, president-elect of the American Academy of Family Physicians, said he's not surprised by the findings that receptionists and other medical staff sometimes fail to grasp that a patient is having a stroke and needs urgent attention. Physicians or nurses should make a point to tell receptionists to call or page them right away if they suspect a patient is having a stroke, he said. If, for some reason, no one is available to speak with the patient, the receptionist should advise the patient to hang up and call 911, he added. It's also a good idea to have a card or poster with stroke symptoms in the front desk workspace which staff can glance at quickly while on the phone, said Kathy Eiler, a Philadelphia practice manager and faculty member on ACP quality improvement programs. Health care professionals may also want to update their staff during office meetings about any new research or guidelines related to stroke, such as the fact that it's becoming more common among middle-aged women, or that women are more likely to present with diffuse symptoms, Dr. Crocco said. Amazing things can happen when health professionals are tuned in to stroke symptoms. Paula Woodward, RN, senior clinical associate for ACP's Center for Practice Innovation, remembers phoning the wife of a patient several years ago to remind them both of an upcoming clinic, and noticing that the husband's voice in the background didn't sound right. Most physicians know they need to target patients at risk of stroke and educate them on signs and symptoms. That doesn't mean doctors or their staff always find time to do it, said Ed Jauch, MD, an emergency medicine physician and researcher in Cincinnati. It's equally as important to target the at-risk patient's loved ones, as they are often the people who end up spotting stroke symptoms and calling for help. In the study co-authored by Dr. Dewey, stroke patients themselves called for help just 19% of the time; the rest of the time, it was a family member or other bystander who called on the patient's behalf. “High-risk patients should not only have strategies in place to minimize the risk of stroke, but they and their family should also be aware of what to do if it happens,” said Ian Mosley, lead author of that study and a graduate student at the National Stroke Research Institute in Melbourne, Australia. Primary care offices would be wise to encourage the relatives of at-risk patients to come in with the patient at his or her next appointment; speak with the relatives by phone about symptoms; or e-mail them information on stroke, Dr. Epperly suggested. 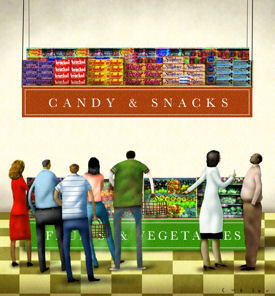 And educators should be sure to explain symptoms clearly, so a patient or loved one understands the difference between, say, an arm that's fallen asleep, and not being able to use one's hand to pick something up, said Dawn Kleindorfer, MD, neurologist and assistant professor at the University of Cincinnati. Tell receptionists to call or page a physician or nurse if they suspect a patient is having a stroke. Keep a card or poster with stroke symptoms at the front desk so staff can reference it while on the phone with patients. Make sure reference materials are written in basic terminology. Update staff on relevant new stroke research, such as on gender differences in symptoms, at staff meetings. Print stroke symptoms on the back of the prescriptions of at-risk patients. Educate the loved ones of at-risk patients about stroke symptoms. Explain to patients and loved ones why they need to respond quickly to stroke symptoms. The American Stroke Association will have a booth at Internal Medicine 2008 where primary care physicians and other staff can obtain printed patient education and office materials on stroke. Materials can also be downloaded from their site.